I grew up on my parents’ amazing true war stories—how Mom joined the Army as a nurse when WWII broke out and Dad signed up to report to the Army the day after he got his medical degree. 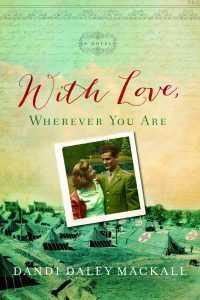 Even as a kid, I could tell their stories—about meeting in boot camp, marrying after a whirlwind romance, then being shipped overseas to different countries and nothing but their letters to keep their marriage alive. Lt. Mom cared for amputees, German POWs, and concentration camp survivors, while Lt. Dad moved into Germany with a British unit and set up battalion aid tent hospitals. On top of that, they left me an Army trunk full of more than 600 of their letters, tied in bootstrings, untouched since 1945. So armed with factual material and a myriad of resources, this book should have been the easiest I’ve ever written. I’d always worked at making my characters real. Instead, now I had to turn real people into realistic characters. I needed to transform nonfiction plots into a narrative arc that would compel readers and keep them reading until the end. Unfortunately, life seldom delivers itself in such a package. Here are a few things I learned the hard way. Might come in handy if you find yourself swimming through an ocean of nonfiction in search of a novel. Tip #1 -- Resolve that you are choosing to craft a story, rather than document your family’s history. Tip #2 -- Free yourself by first documenting your family’s history. My first draft was intended for family only (including cousins). That way, I could theoretically do what I wanted with subsequent drafts. Tip #3 -- Make that first draft a free-flowing doozy! Mine ran about 900 pages. Tip #4 -- Family stories are generally anecdotal, short and sweet (or not so sweet)—more like short stories than a novel. Decide on one major theme. Tip #5 -- To help you find the novel’s narrative arc, ask (yourself) a major dramatic question before you start that next draft. “Will they/he/she or won’t they ______________?” You have to be able to answer Yes or No—and don’t answer it until the climax. Mine was: “Will their love, their marriage, survive the war?” Keep that question in front of you as you write. Tip #6 -- Characters need arcs too. Will Helen come to realize that she needs other people? Will Frank discover that he…? Tip #8 -- I wanted to put in all of my eleven favorite aunts and uncles who served in WWII. But it was too many for readers to care about. Combining or cutting characters may be the hardest job. Do it! Tip #9 -- Craft your climax early on, even though it may change. You’ll need something to aim at. Every chapter and every scene should build to this moment. If it doesn’t, bye-bye scene. Tip #10 -- Sculpt. Once you have that monstrous, ridiculous, oversized draft, like a rough block of clay or marble, sculpt and carve until you’ve found your novel. Then polish, polish, polish. Dandi Daley Mackall is the author of 500 books for all ages.